If there’s a will, there’s a way…the Aardal Family | Families for HoPE, Inc.
As we approach the HPE conference this summer, we want to share with you ways that our HPE families are getting creative in their efforts to raise personal funds for their family’s conference expenses. If you would like to share an idea, please contact us at info@FamiliesforHoPE.org. 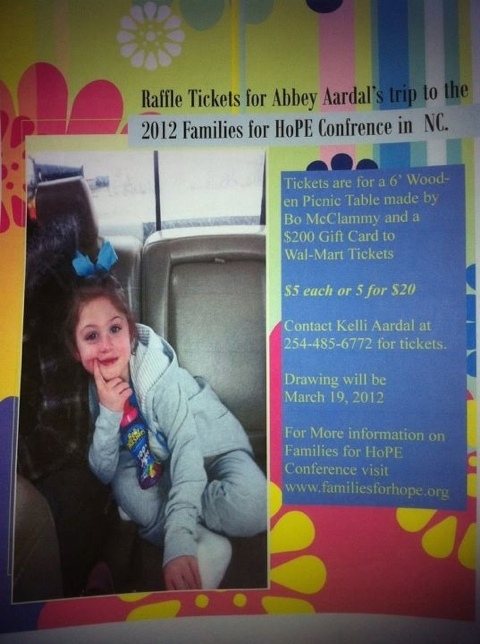 The family of Abbey Aardal from Texas is conducting a raffle. Prizes are a 6′ picnic table and a $200 Walmart gift card. Below is the flyer with more information. ← How can YOU “Share the HoPE”?